On January 3, 2012, we introduced our iPad app, developed for us by ShoutEm‘s team. If you have just received a new iPad for Christmas, don’t forget to download it here. Alongside Google, Wikipedia, Reddit and many others, we decided to voice our opposition to SOPA and PIPA and join the protests earlier this year. We also expressed our support for the Declaration of Internet freedom. When we launched TNW Magazine last February, we had big ambitions, but we still didn’t expect our monthly digital magazine to grow so fast. As we reported, it hit the 100,000 monthly session milestone four months ahead of schedule. Beside the iPad, it is now also available on the iPhone and on Android, where it is optimized for the Nexus 7 tablet. You can download the ‘WHITE’ issue now. Update: We have decided to stop producing TNW Magazine for Android. Awesome writers have joined our team this year, with the addition of Josh Ong, Ken Yeung, Emil Protalinski and Jamillah Knowles – also a great voice you may have heard on her BBC podcast, Outriders, and on our Daily Dose. We also welcomed back Robin Wauters as our European editor, and Joel Falconer as our Features editor, working directly with our many external contributors. There were promotions as well, with Alex Wilhelm becoming our Business & Political editor, and Matthew Panzarino our current US Managing Editor, succeeding Brad McCarty, who stepped up into a new role as our Director of Business Development. We would also like to take this opportunity to thank our interns Asam Shah and Nick Summers for being with us, and give a shout-out to TNW alums that have moved on this year. If you are curious to know more about our editorial team, check out this post and you may learn a few things. By the way, did any of you watch Bravo’s Startups: Silicon Valley, featuring TNW’s Video Director and Startup World‘s co-organizer, Hermione Way? The latest edition of The Next Web Conference Europe came up with several changes, such as the introduction of our CxO Summit, multi-track conferences and Kings of Code Hack Battle – which all happened over three very busy but fun-filled days, thanks to our great speakers, presenting companies and participants. 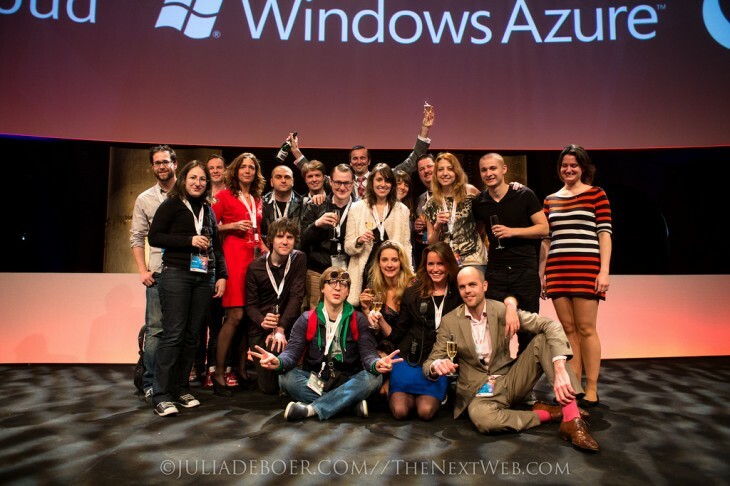 The next edition will take place on April 25 & 26, 2013 in Amsterdam, and you can already book your seat – we had sold 100 tickets by the end of November . When we found out that Paris Hilton was offering to send out a sponsored tweet for $3,000, we decided to use this as an experiment. You can click here to find out more about our conclusions, but the Cliff’s Notes version is that Charlie Sheen is more powerful after all; his tweet mentioning TNW Labs’ Twitter Counter brought us more traffic than the heiress. This was not our proudest moment this year, but we also learnt some lessons when we found out last April that we had been hacked for SEO, alongside other major tech sites. In practical terms, someone or a team managed to insert bogus links in some our articles, to boost the ranking of third-party websites on popular keyword. Apparently, the hacker(s) had managed to access our backend through an editor login. Needless to say we have added an extra layer of security since then. As you may know, we are developing in-house projects through TNW Labs, which includes products such as Paydro, Twitter Counter and Spread.us, the social mailing list we relaunched ealier this year. As for our press release management company, PressDoc, it introduced an Embargo feature and started to support multiple sources with Open Press Rooms. You can read more here about what it’s like to work at TNW Labs, according to our Chief Monetization Officer, Jorg Ruis. Our co-founder Patrick de Laive toured four Latin American countries last July to organize the first local editions of our Startup Awards in Argentina, Brazil, Chile and Mexico. Our purpose? Find and award the best startups, entrepreneurs and investors in each place. Thanks again to the supporters who helped us make this happen on a very short notice. In 2013, we will continue this international expansion, and celebrate Startup Awards in twelve European locations. In addition, we are also supporting the European Commission’s Europioneers, which will award Europe’s Tech Entrepreneur of the Year. This was an important milestone for us: the first (but not last) edition of TNW Conference outside of the Netherlands. In partnership with our friends at MobMob, we held TNW Conference Latin America last August. In addition to top-level speakers, it also boasted a hackathon, a Startup Battle featuring the best of Latin America’s accelerators – and amazing participants. Here are some pictures of the event; you should also check out the opening video. We kickstarted TNW Academy last March with a webinar on SEO, and have already announced several online classes for 2013. In addition, we have expanded our educational offering with the launch of TNW Academy Guides. Our CEO Zee jokingly named our redesign as one of the top tech news this year. One thing is sure, we are very happy with the positive feedback we have received on this new version, which we call The Next Web: Reader Edition – and we hope you enjoy it as much as we do. It’s not easy to catch the eye of a busy blogger, but some of our readers are very good at it. The key word here is customization. This year, we received a personal video pitch, Apple engineer Peter Zich created a 3D version of our logo, and ILaseYou confirmed that lasers are cool. We launched a Windows 8 app last October, which you can see in action in this video. It was introduced before the general release of Microsoft’s new OS, and features video and audio embeds. We opened a Global Job Board to help companies find top talent – and we are also using it to promote our current job offers. If you think you have what it takes to join our editorial staff in San Francisco, please don’t hesitate to apply. On 12/12/12, our very own Boris thought it would be a good idea to announce that we were introducing a new feature called ‘Filters for Posts.’ “Filters are the future” comments ensued. Don’t miss our other 2012 lists for more great memories.